A person commits theft or larceny, when without permission knowingly obtains or uses the property of another with intent to either temporarily or permanently deprive that person of his property. Florida law is stricter in defining theft than compared to old common law definitions or other jurisdictions because deprivation (taking) of property doesn’t have to be permanent it can be temporary. So the defense, “I only intended to borrow.” probably won’t work. Although borrowing without permission may be a good argument for mitigation of sentence. There are several ways to steal from another, such as by force (robbery) or by fraud. Or the simple taking of property of another. Shoplifting, Retail Theft and Larceny are common terms used for theft. Burglary is most often associated Theft Crimes. Theft is usually defined as Grand Theft (Felony) or Petty Theft (Misdemeanor). There are varying degrees of Grand Theft depending on the value of the property, type of property such as an automobile, or the type victim, such as a senior citizen. Petty Theft is generally defined as stealing of property whose value is less than $300.00, and is 2nd degree misdemeanor (Punishable up to 60 days in the County Jail) if you have no priors for any theft. If you have one prior theft charge and you commit a Petty Theft you will be charged with a 1st degree Misdemeanor (Punishable up to 1 year in jail) Even Petty theft (Felony Petty Theft) will be treated as a felony (Punishable up to 5 years in State Prison) if the you have two or more prior convictions for any theft. *Further, the court may suspend the driver’s license of anyone adjudicated guilty of theft. Embezzlement: Is the fraudulent conversion of personal property of another by a person in lawful possession of that property. The Embezzlement crime usually occurs where the employee steals from the employer. False Pretenses: Obtaining title to personal property of another through an intentional false statement of a past or existing fact with the intent to defraud the other. Larceny by Trick: Similar to False Pretenses, but the theft only gets the property not the title. Extortion: Obtaining property of another by means of future threats, to do harm to victim, the victim’s family or expose information. True Owner: Establishing you are true owner of property. Mechanics Lien: Keep as repayment of Debt. Must be a legal relationship. Possible Double Jeopardy: Issues when being charged with Grand Theft and Petty Theft for same items or Dealing in Stolen Property. Call Palm Beach attorney Steven M. Logan for defense of theft crimes at (561) 791-1882. 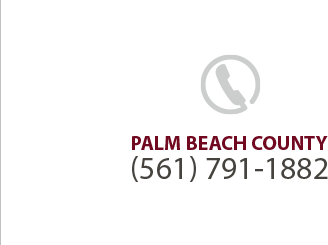 Serving Palm Beach, West Palm Beach, Ft. Lauderdale, Ft. Pierce, Stuart and Glades County.